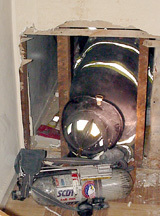 The Hasbrouck Heights Fire Department conducted "exiting a collapsed building" exercises on September 3, 2002 in a Kipp Avenue house slated for demolition. that firefighters are in the structure fighting the fire, the building partially collapses and the fighters following either a hose or life line to exit the danger. 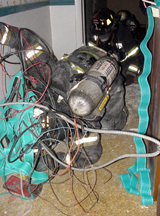 A rope bag or personal rope would have been dropped upon entering the building. Three trainers carefully supervised the maneuvers to insure full personal safety through the exercise. It was emphasized that this was not a speed drill or primary or secondary search mission. The goal was to methodically go through the course, regularly informing command of their location, constant communications with their partner and changing air tanks. 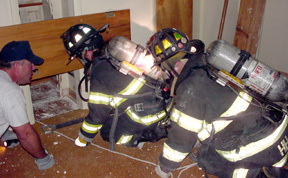 To simulate smoke conditions, wax paper covered the masks of those taking the training so that there was no visibility. The house was dark (except for the flash of the camera and occasional trainers flashlight). 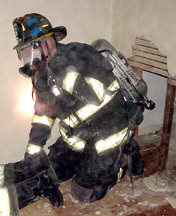 Obstacles included: holes were cut into the walls so that the fireman had to maneuver through exposed studs, through closets, and tunnels created with plywood debris that would simulate a ceiling collapse. Sometimes the space was so small that the tanks had to be removed, positioned ahead of the firefighter as they crawled through the obstacles. 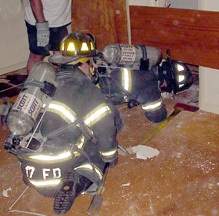 Sections of the floor were exposed so that the fireman had to move slowly over open beams. They had to go through a cluster of downed wiring, as in a drop ceiling with lighting collapsing. As viewed from the inside of the house, the training was grueling and thorough. The fireman completing the course, and the trainers displayed highly-disciplined precision and professionalism. Briefing the department and providing practical tips on the maneuvers. Determining how to pass through the obstacles with zero visibility. Using tools to help crawl over open beams. 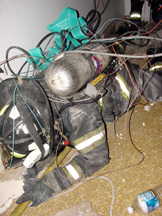 Edging through a cluster of downed wiring that would represent a ceiling collapse. Tools and air pack first, getting through, then strapping the air packs back on. 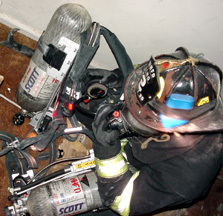 Changing air packs in mid-exercise.